If I ever thought I would be back at camp at almost 30 years old for an experience as soothing and satisfying for my soul as it was when I was a kid, I would've thought I was dreaming. I came upon "Soul Camp" on Instragram, my haven for insta connection, and knew instantly I had to attend. It would be my first retreat, but I was diving in knowing I had to be a part of this. To combine all things mind, body, soul with the over night camp experience was the ultimate for me. I packed the car with my two soul sisters and we drove up to the mountains of Pennsylvania with our smiles on and hearts pumping in anticipation for what was to come. We had no idea what to expect but at this point in our journey we knew that by showing up, we were in for an expansive ride. We were the first to arrive, greeted by tie dye and warmth and brought to our bunk. Just as it was 15 years ago. One room, wood cabin, lined with 15 single beds and a community open stalled bathroom. I immediately felt the rush of knowing that this environment would bring all of us women together in a way unlike anything in life and connections would form instantly. A knowing that was soon revealed. While we waited for others to arrive, we put on our bathing suits and went straight to the lake to paddle board. Which was a first for me! We stood up and paddled out to the middle of the water. Looked around and at each other and knew we were in pure bliss. Knew we were in for more awakening. More experience. More connection. More consciousness and clarity. And more fulfilling fun! All arrived and settled in for the next part of our journey. This leg however would be different from all the rest to date. This personal journey of life we are all on, was about to be opened up wide, to include a community. A community of others aligned. To a safe space of open hearts and minds. To a place that supported transformation and offered the sanctity of healing. This was our new home. All of ours. Our new family. The support for our soul. For our journey through life. I was home. And oh how grateful I was to have arrived. The first night kicked off the powerfully potent process with a Fear Burning ceremony. The beautiful camp and staff built an incredible bon fire for us all to gather around. A soul sister, Julie, picked up the mic and led us through an exercise of writing down what we wanted to release, get rid of in our life and let go of. After such breath and words of wisdom, Julie led us to throw this card into the fire and chant Swaha, sanskrit for Let Go. Swaha! Swaha! We all chanted and the words vibrated through us all. Louder. Stronger. Pulsing through us. Individually and together. Incredible it was. Transformative. We spent the rest of that night around the fire connecting with others. Connecting in a way that I've only rarely felt before. Open hearts. Open minds. People wanting to know you. Not about what you do or have. The things in society that define us now. But about who you are and your dreams. Your journey, your goals. Why you were there. What you wanted now in life. Looking deeply into each others eyes. Speaking from the soul. Connecting from the heart. That was the vibe between all this weekend. That's how this crew of people became a community. With all guards down and all walls breaking, we were all here together. Let me tell you, this weekend was exhaustingly exquisite! From revelee early wake up, to packed in periods of all things mind, body, spirit. There was absolutely no lack here. We got our time and moneys worth that was for sure. We tapped into every part of us possible with the brilliant guidance of some awesome instructors. To name a few: Intensati with Patricia Moreno, Vikaz Chiropractic with David Mehler, Heart Centered Yoga with Ashley Turner, Access Your Intuition with Betsey Cohen, Meditation with Terri Cole. The list was abundant and full of knowledge and practice to put to positive use in life. We were also fueled with the best nutritious foods prepared and presented in the communal dining hall. Plenty of snacks and goodies throughout the day to keep your energy vibrating as high as your frequency was. Evening activities besides the bon fire included a fun blue vs red competition, talent show and full blown dance party to the beats of DJ Tasha Blank. Literally she kills it. And to think everyone here was sober... a much different reality than what most are immersed in as "fun". All dancing to the beautiful beat of their own drum and loving life as is, together. It was incredible. I am so excited and honored to announce that I will be teaching at Soul Camp 2015! So secure your spot today and come experience some life changing amazingness with me! 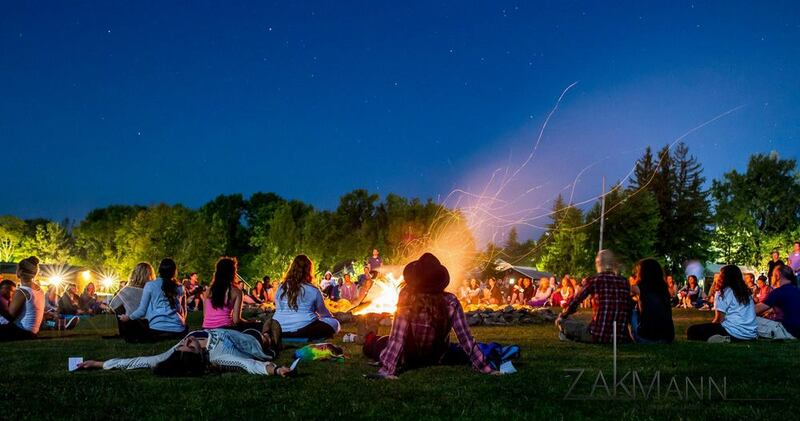 Sign up here... soul.camp !! Hope to see you at camp next year!! LIVE STREAMING WORKOUT at 8pm (EST) TONIGHT! !